We at Super specialize in manufacturing of different types of evaporators. We mfg rotary vacuum evaporators, wiped film evaporators, falling film evaporators and etc based on client 's design as well as his process applications. These evaporators are precisely designed and engineered to give the best performance. The MOC contact parts can be borosilicate glass (3.3) and PTFE along with MS or SS supporting structure and parts. Capacity 1-2 ltr, 5 ltr, 10 ltr, 20 ltr, 50 ltr and 100 ltr. We are leading manufacturer, exporter and supplier of rotary evaporators. We offer rotary evaporators in capacities such as 1-2 ltr, 5 ltr, 10 ltr, 20 ltr, 50 ltr and 100 ltr. Additionally, they are available in GMP as non GMP standards. Super Rotary Evaporators are equipped with micro processor based control panels and fully automated. Currently, more than 200 clients are satisfactorily using these evaporators. The overhead assembly of rotary can also be tailor made as per client requirements and we do provide installation of same at client site. 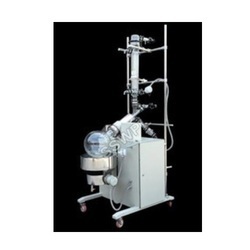 We are the manufacturer , supplier and expoter of Rotary film evaporators .